Our thanks to History Scotland for permission to share this. 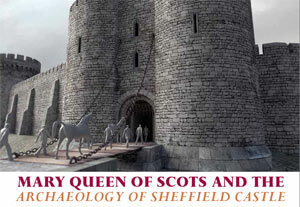 I wish people would stop calling Mary Stuart a “prisoner” whilst in Sheffield. She was no prisoner, but in protective custody. The same as any person who’s life was in danger from a modern day trial. She asked for this protection too! Yes it would have seemed like being a prisoner, but that’s what anyone would have said even these days if they HAD to have guards around them all the time. Technically speaking she wasn’t even a Queen anymore. She had resigned. However Queen Elizabeth and the English Court did not except that resignation on the grounds it seemed forced. Mary did finally become a prisoner after the Babbington plot, she stood trail after the court had ruled that she was a “private” woman and not a Queen. Calling her a prisoner reduces the status of both Sheffield Castle and the Manor (especially) since that was rebuilt to house her staff. If you want to call her Queen, then they are Royal Palaces fit for a Queen to live in.